Salal Credit Union takes its social media strategy to the next level by using location-based platforms to connect members with products. This article was originally published in the 2Q 2011 edition of Credit Union Strategy and Performance (CUSP). Subscribe today for online access to this issue for more tips and insights. Social media is a great way to communicate with members, but managing the different vehicles requires precious employee time and credit unions must carefully weigh their options for leveraging online outlets such as Facebook and Twitter. Salal Credit Union ($339M, Seattle, WA) takes a trial-and-error approach to exploring social media. Its method has proven to pay off as the credit union has found newer networking applications, such as foursquare, can shore up interest in promotions and products for very little cost. Salal Credit Union sought an innovative way to expand the social media portion of its marketing outreach. It decided to try out foursquare, a site where visitors announce where they are physically by “checking in” via a mobile phone. Salal used it in promotions it was running for products such as free checking and auto loans. “We definitely wanted to cultivate new members,” says Shannon Perry, the credit union’s senior marketing and communications specialist. The credit union’s established social media strategies include holding lively discussions on Facebook and frequently messaging members about their concerns and praise for the services, and an added marketing push through foursquare had to blend well with those efforts. Salal’s integrated social media strategy is simple: Use a trial-and-error process liberally. So, when marketing executives learned about foursquare, they had no doubts about giving it a try. Foursquare is a mobile phone-based social media tool through which users “check in” to their location – such as a coffee shop or retail store – using a smartphone app or text message. Foursquare announces the check-in and tallies the user’s number of visits to the check-in location. For users, foursquare provides the opportunity to learn more about their surroundings and explore new neighborhoods. Users who frequently visit certain locations are given points and badges, and the user who most frequently visits a particular location is named the “mayor.” All users have access to discounts and coupons at nearby merchants. Salal pushed out its first foursquare marketing campaign in March 2011. 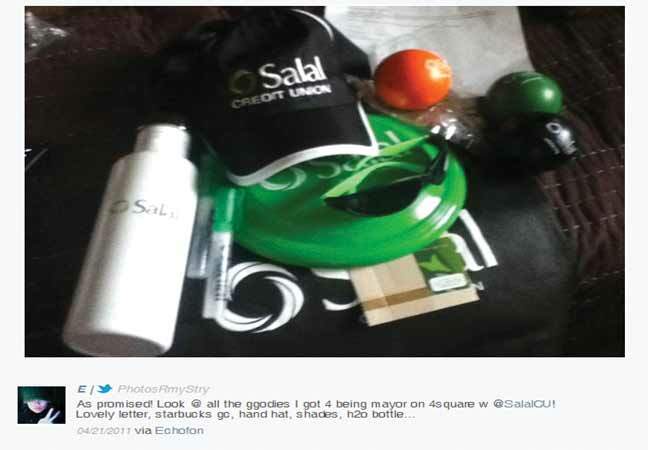 It offered “Sunny Day at Salal” prizes such as a Frisbee, baseball cap, water bottle, or Starbuck’s card to a branch’s duke (one of the available badges) or mayor. Other members who checked in could show the frontline staff the unlocked promotion on their phone to receive a smaller prize such as a mint or pen. During the credit union’s month-long campaign, staff used its foursquare interactions as an engagement opportunity to talk about the credit union’s premium checking. Currently, the credit union is running a foursquare promotion for checking and auto products and continuously rewards check-ins with smaller tokens. Such engagement provides an ongoing springboard to talk about credit union products. Salal also leverages Yelp’s social media check-in tool. Unlike foursquare, however, Yelp charges a subscription every six months to use its platform for business marketing. Overall, foursquare is “a little more robust” than other location-based apps in drawing users, Perry says. Salal boosted its free checking penetration by 30% with its first check-in promotion. The credit union can’t confirm if those sales are directly connected to foursquare because it can only track the number of clicks on the promotion rather than the sales that result from the clicks. Still, Perry attributes much of the boost to the engaging check-in campaign, which exponentially grew as foursquare members Tweeted and Facebooked about Salal’s foursquare promotion. I've been waiting for a credit union to use Foursquare. Great story with a great message at the end -- "...Even if credit unions are not on these channels, their members are."